“When I was young, I was told that I was pretty, and I believed it; later I was told that I was intelligent and I believed it; they tell me today that I am a saint. But now I have no illusions.” This is how St Teresa summed up her own life. It shows a directness and honesty that is illuminating. Teresa was born in 1515 and lived til 1582. She became a Carmelite nun and a great friend of John of the Cross, himself a Doctor of the Church. Teresa was the first woman to be made a Doctor of the Church. Pope Paul VI broke the tradition of men-only doctors in 1970 when he elevated both Teresa and Catherine of Siena to this high status. At the time of the Reformation, Teresa was a strong defender of Catholic doctrine and undertook the reform of the Carmelite Order. In this she had many trials and much opposition but she had an indomitable spirit and kept going, winning through in the end. Teresa wrote many great works on prayer and the interior life. 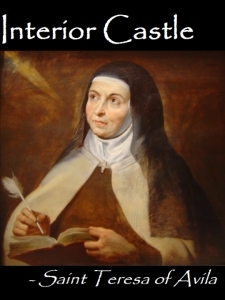 Her most famous work is ‘The Interior Castle’ which is still considered a spiritual masterpiece and is widely read.